You might be familiar with the star Betelgeuse. It is a red giant star that marks the shoulder of the constellation Orion. The Herschel Space Observatory took an image of Betelgeuse and its surroundings in the near infrared, and the results were recently published in Astronomy & Astrophysics. The result seen here shows Betelgeuse in the center, with a curved bow shock where the plasma streaming out from Betelgeuse (solar wind) collides with the interstellar wind. One of the interesting things you can see is that the bow shock has layers, which indicates the strength of the star’s solar wind varies over time, meaning that the star has periods of greater and weaker activity. 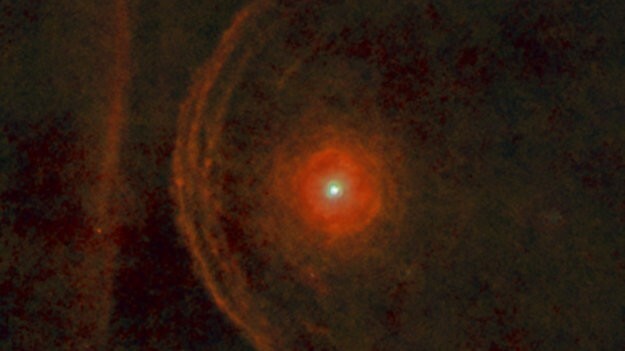 During its active periods, Betelgeuse is losing more mass, hence the bright layers in the arc. You can even see smaller arcs closer to the star where matter has streamed away from Betelgeuse. 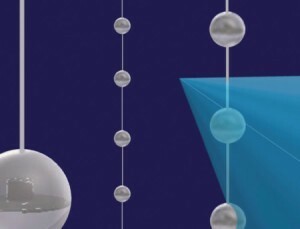 Another interesting feature is the straight line of material on the left of the image. This appears to be an interstellar cloud being lit by the light of Betelgeuse. Given the motion of the star, the shock wave and cloud will collide in about 5000 years. So stick around, because that interaction will be fun to see.